It&apos;s early and you need a quick-fix breakfast before you go to work, and because you stood motionless in the shower for longer than intended, time isn&apos;t on your side. You shove a couple of pieces of wholemeal in the toaster slots and wait. But alas – there comes no pop to signal that your snack is ready. Now you have to attempt the finger-scorching task of retrieving the toast from the narrow confines of the toaster like a game of Operation, or give up and tip the appliance upside down and create a beach of crumbs on your counter top for you to clean up when you get home. 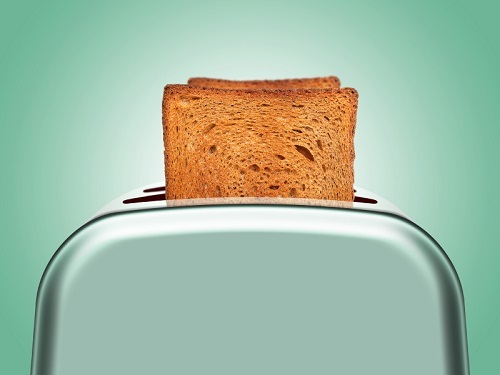 Springs are compressed in toasters to create enough tension to catapult the bread when it&apos;s sufficiently toasted. The spring-loaded tray that is triggered when the timer goes off, which prevents us from having to tip the toaster upside down and create inconvenient crumb spillage. On your way to the train station you feel one large droplet of rain splash upon your nose, but no need to panic, because you&apos;ve got your trusty umbrella packed away in your bag! You unravel the tie and unleash the canopy – but wait – the retractable pole is sliding all over the place and the parasol refuses to stay open because the notch that fixes it in place is loose! This wouldn&apos;t be so bad if you could pull off the wet look, but you can&apos;t.
Most umbrellas function with tension springs inside the shaft to extend and retract the canopy. The top spring helps the canopy click into place to keep us dry during spring (and summer, autumn and winter) showers, and is pressed in to release it when required. You&apos;ve made your train without many seconds to spare, but just when you think you can relax, you remember a bit of paperwork you were meant to fill out in preparation for the morning meeting. Thank goodness you have a trusty pen in your pocket. However, the clicker on top of the pen won&apos;t click – in fact; it&apos;s become lost in the pen, so that now there&apos;s nothing to keep your nib in place. Suddenly, there&apos;s a massive jolt of the train (due to the lack of springs in the train&apos;s suspension) that causes you to drive a hole through your paperwork. Even though this only really applies to click-top pens, springs provide tension to retract and detract the ink cartridge to provide us with rapid nib access. It&apos;s surprising to think how many objects rely on the aid of springs – because they&apos;re part of an internal design, we are often none the wiser. If springs are an integral part of your product, then as experienced compression spring manufacturers, European Springs are here to be a component in your project. For any enquiries about our services, contact us on 0208 663 1800 to see how we can bring your design into the future, otherwise you can also find us at our Facebook and Twitter pages.